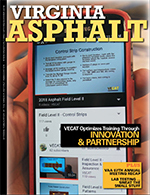 Your digital edition of Virginia Asphalt - Spring/Summer 2018 is available now. Clicking on the Table of Contents will deliver you directly to that page of your issue. Thank you for reading! NOTICE OF CORRECTION: The article "Lab Testing ... Sweat the Small Stuff” featured an incorrect image caption on pg 16 and an incorrect graph on pg 17. In the article "Congratulations Richard J. Schreck Scholarship Recipients,” the name Andrianna Daniels was spelled incorrectly. Naylor has corrected these errors and reprinted the issue. Naylor Association Solutions, as publisher of Virginia Asphalt, apologizes for the errors.